But read on; there’s a snag. Yep, one of the infamous Sack of Ferrets has escaped the bag with a plan to kill the remaining free speech on the internet. but I smell a DemonRat. This entry was posted in First Amendment, social media and tagged Andrew Yang, Democratic presidential candidate. Bookmark the permalink. This guy is a communist dictator. The LAST thing we should ask for is someone to censor anything. The answer to speech we don’t agree with is more speech. I think there should be equal access and enforced “equal time” for debatable issues. The first 200 years of this country we cherished free speech. It was universally understood and respected. Now look at it. They are pushing this as hard as gun control, maybe harder. 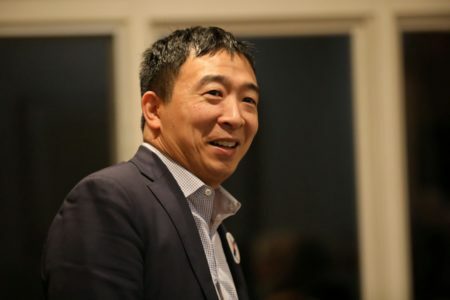 What this POS Andrew Yang wants is none other than the Minister of Truth in George Orwell’s dystopian novel Nineteen Eighty-four. This is too funny it will never happen, all they have are lies and delusions, If they didn’t run with fake media it would mean the end of the Party. P.S. He has no such power, it’s in the First Amendment. Will he be going after MSM? They’ve already committed treason. This “Feinstein Chauffeur” probably set up Project Dragonfly in China. Anything not Leftist is “fake,” of course. The mass murdering white/christian hating Bolsheviks fled from the Soviet Union when the native Orthodox Christian Russian people took back their nation from them when they collapsed it. The Bolsheviks fled from there and came here (and other Western nations) under the guise of “religious persecution” in the 70’s & 80’s. It took a little while to infiltrate into our government,media, foundations, think tanks, corporations, scientific fields, “education”, & finance, and than morphed into the cultural marxist liberals of both parties. We are fast becoming the USSA.